Be Proud. ‘Onions are an essential, healthy food for the modern consumer. And because of our ideal climate and the expertise of British Onion growers, packers and processors, British Onions are the world’s finest!’. So says the British Onions website. Be triply proud. This recipe uses THREE different types of onions. 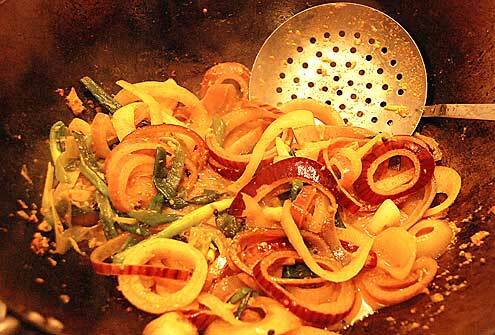 Heat the oil in a wok and heat the cumin seeds until they splutter. Add the ginger/garlic paste and sautÃ© until cooked. Add the dry spices, salt, water and yoghurt and cook for a few minutes. Add the onions and continue cooking until the onions are soft – do not over cook. Verdict: This is a hot and crunchy dish.